The Spanish Repertory Theatre presented a Cuban classic by Virgil Pereira. Directed by Leyma Lopez, Aire Frio introduce us to the Romaguera family for a period of twenty years of despair, misery, broken dreams and hopes. The cast: Pablo Andrade (Oscar), Zulema Clares (Luz Marina), Idalmis García (Laura), Erick Gonzalez (Luis), Sandor Juan (Enrique), Ana Margarita Martinez Casado (Ana), Mario Mattei (Don Benigno ) and Frank Robles (Angel). 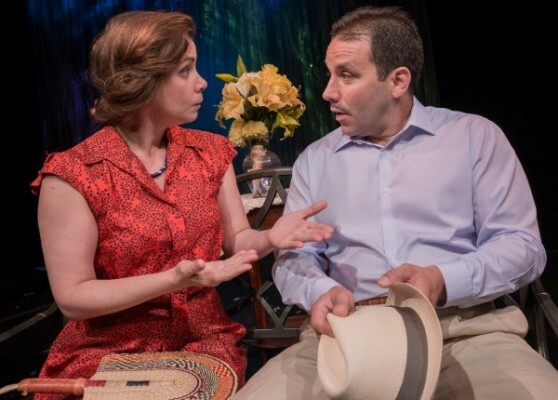 Aire Frio transport us to the late fifties and seventies where we can learn a little about the political and economic conflicts that Cuban families faced at the time. The play talks about Luz Marina’s struggles to support her family despite her lack of education, loneliness, the sexist father, her desperation to solve all the family problems and about the suffocating hot weather in the island. However, the Cold Air Luz Marina longs is nothing but the tranquility she needs to be happy. Clares interpretation is seamless. She is devouted to her sewing machine just like Luz Marina is. It is a luxury to admire the experience of Ana Margarita as the submissive mother and Frank Robles as the demoralized father who fails at supporting his family. Its producer and director bring a strong and balanced cast which is able to carry out each of the nuances of their characters. Robert Weber Federico pike as Disenador of scenery, costumes and lighting. The translation to English by Kevin Tighe-Martinez is accurate. At the end of the play we saw Leyma Lopez hugg the cast aI thanked him and was given the key code Garica Manolo Oliva for their contributions to the growth of theater.